Boles fashioned the vanity, linen closet and pocket doors from honey-colored hemlock. 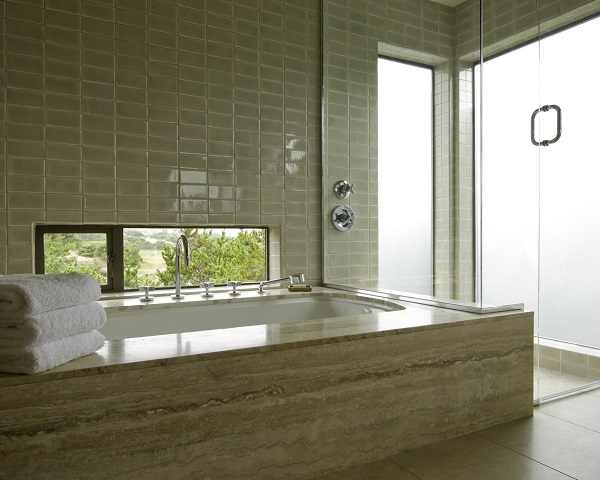 Stone pavers cover the floor, and travertine wraps the bathtub and trims the sink. But crafting such a seemingly minimal space requires close attention to detail. For Boles, an important consideration is the different sheens of the materials. “With a limited, neutral palette, we like to play around with different levels of reflectivity,” he said. Therefore, the wall tile is glazed but the floor is honed. 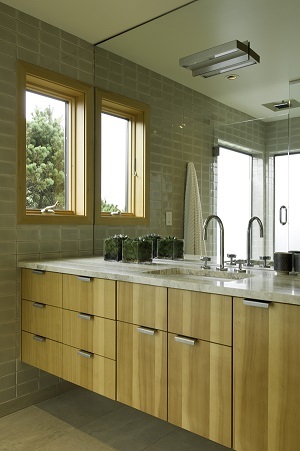 The shine of the faucets and hardware accentuate the matte of the wood. Finally, he placed an unframed mirror adjacent to the window to double the window’s presence and the light that the room receives. “Details like this just give a richness and a subtle contrast, which ultimately reduces the scale and adds to the room’s overall intimacy,” Boles said. Designer Kricken Yaker knows how to do white. “We’re all about making a space feel very light and bright,” said Yaker, who owns design and build firm, Vanillawood, with her husband, James Yaker. 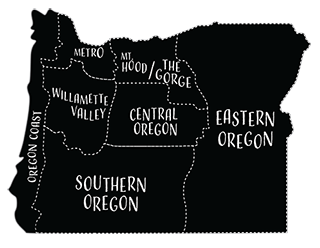 “Especially in the Northwest, because we are so anemic on light for a big chunk of the year.” This approach, well-honed over the years, is evident in a recent project the couple completed for a custom Hood River home. The challenge was to make the narrow principal bathroom appear more spa-like and accommodate two people, while sticking to a lighter palette. “When doing a light or white space, it’s important to bring in texture to keep it from going sterile,” Yaker said. Yaker introduced a variety of materials in the new room. 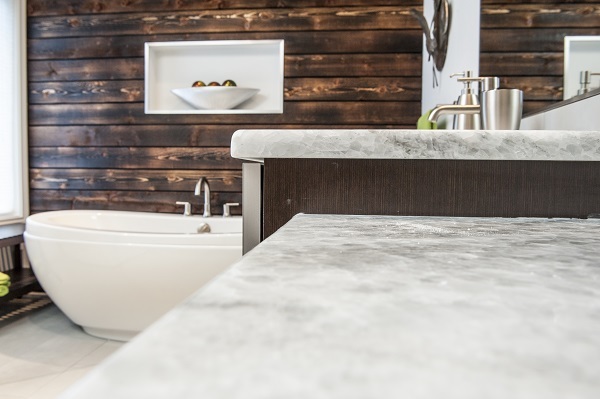 On one wall is a floating vanity treated with Vanillawood’s signature finish, a custom automotive paint that’s high gloss, durable and easy to clean. The shower floor is covered with river rock for an organic element. “And it feels really good on your feet,” Yaker said. Carrara marble floor tile lends a little Old World charm, while oversized matte subway tile was set in a linear grid on the wall. “It feels more modern and clean that way, especially with white grout,” noted Yaker. 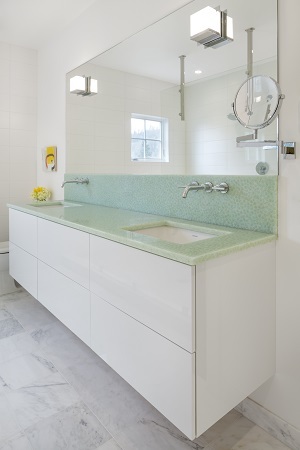 A green-hued recycled glass counter tops the vanity in a minimal ribbon of color. Now, the bright new bathroom can suitably battle even the most overcast of days. 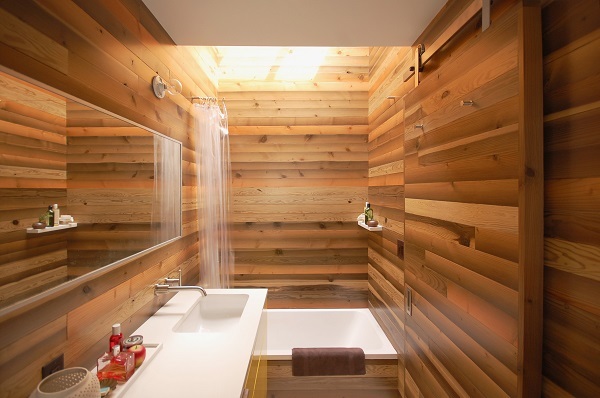 When a Portland homeowner contacted architect Jeff Stern, founder of In Situ Architecture, to renovate the tired little bathroom in his condo, Stern got to brainstorming. “The question was: How do we make this tiny, cramped space bigger?” he said. 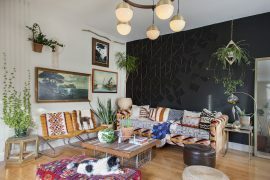 Changing the room’s footprint wasn’t an option, so Stern suggested wrapping the 55-square-foot interior in one consistent material, to make the room feel larger. 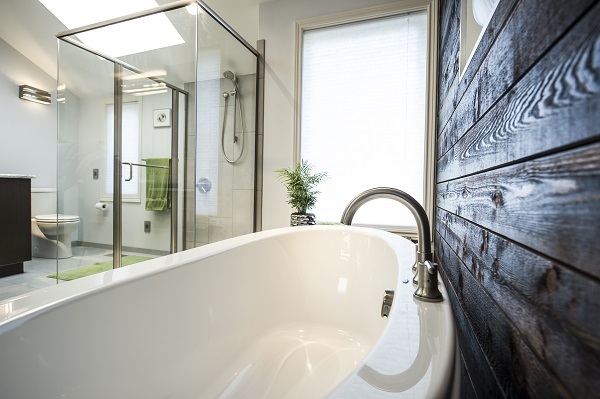 Since tile proved cost-prohibitive, Stern proposed wood. Next came inspiration images of Japanese bath houses. “Those really became the driving force for the design,” said Stern. He also fitted the ceiling with a wall-to-wall skylight to flood the space with natural light. “It brings the wood to life,” Stern said of the light, and counteracts the potential visual weight of all the wood grain. 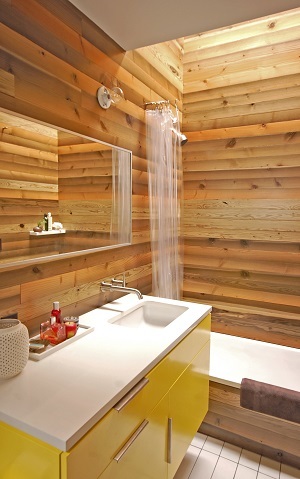 Additional elements were incorporated to keep it simple: a wall-hung vanity in bright yellow, a disappearing shower rod, a bathtub with clean lines and elongated subway tile on the floor. 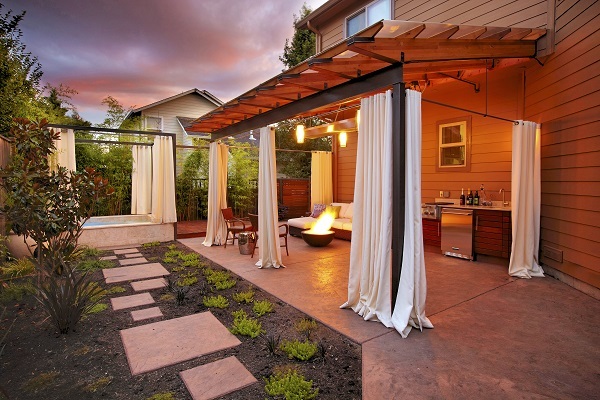 Lastly, a sliding door replaced the old swing variety to make the most of the small-but-revived footprint. Earlier this year, designer Joel Fraley was asked to update a principle bathroom in a Beaverton family home. The clients knew one thing for sure—the 1980s fixtures and white tile counters had to go. Fraley and the homeowner hit the slab yard to search for a replacement counter. At this point, they envisioned a new bathroom swathed in earth tones and slate. Then a piece of quartzite changed everything. “It looked like quartz crystals pressed together,” recalled Fraley. “We took one look and said, ‘Wow!’” The slab went home with them, and the rest of the design evolved from there. 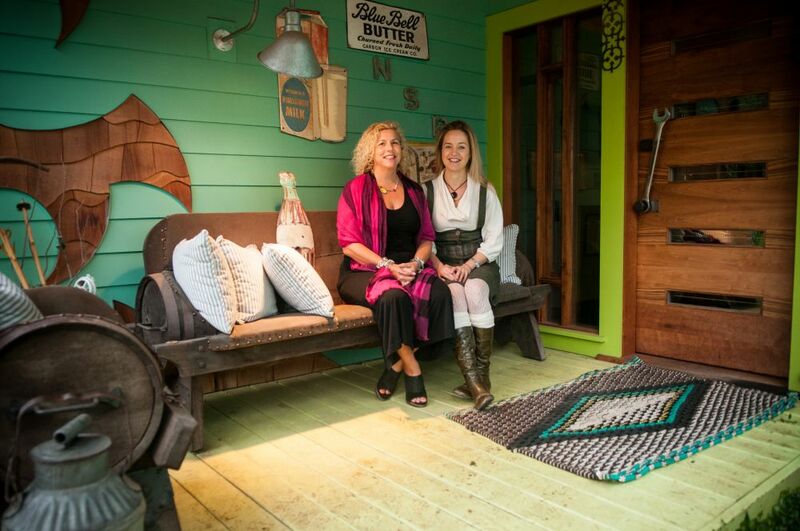 “Once that material was chosen, the room became much more contemporary,” said Fraley. 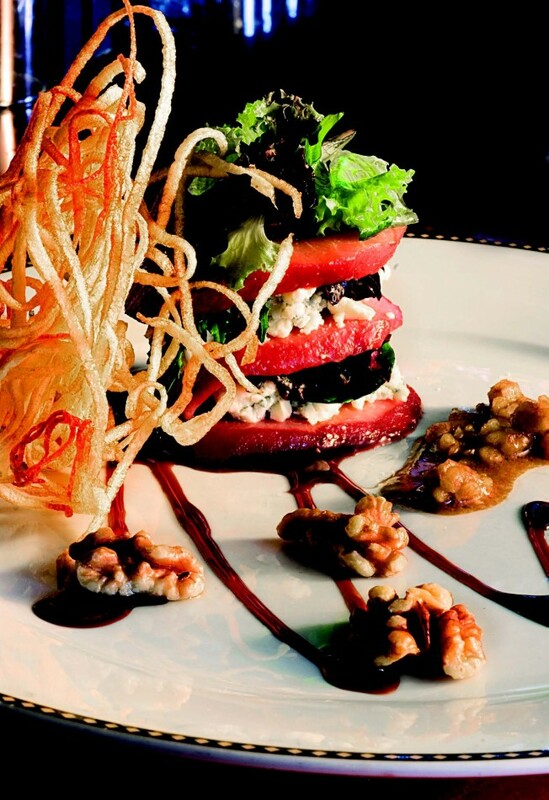 To keep costs down, Fraley used the existing layout of the 200-square-foot space, but improved function. He installed his-and-hers vanities to enhance storage capacity. 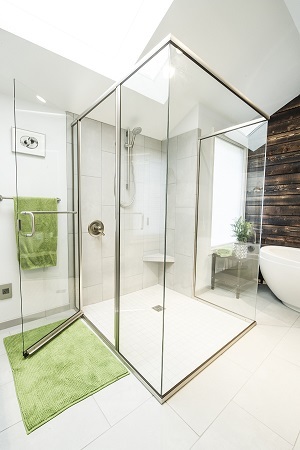 A curb-less glass shower increases accessibility but doesn’t compromise sight lines. Muted blue-gray tiles let the quartzite come forward, while a cedar feature wall adds pleasing contrast. The wall planks were “lightly toasted” using an ancient Japanese technique, called Shou Sugi Ban, that requires setting the wood on fire. 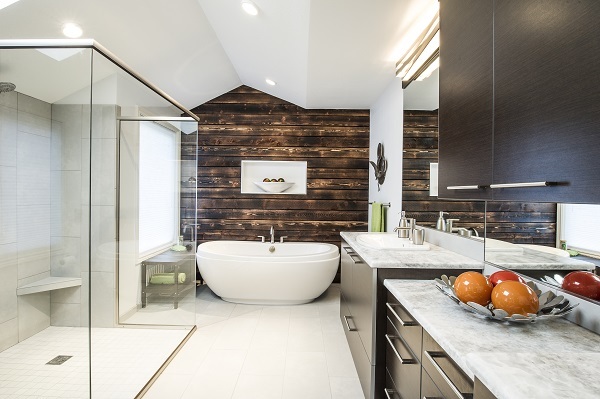 Rosewood cabinetry complements the burnt cedar, to further balance the light and dark tones. Since the renovation, the whole family has adopted the room. There’s enough counter now for “hair central,” where Mom and her two teenage daughters can do their hair together. As for Dad? The quartzite has him dubbing the room the Fortress of Solitude, in a nod to Superman’s private retreat. Now that Mark has moved me into second place, I will conmemt on my high number of temples that I have been to, etc. As you should infer from my previous conmemt, I am not old enough to be retired, but I am probably older than many or most others who have conmemted. I also have moved around a lot and have family in different locations which allow me to visit many over time. I have lived in Utah for a time since I was endowed.Based upon the temples on Mark's list, we may have lived near each other now or in the recent past. I also travel some for work and have been to a couple of temples in my travels. I know that my retired parents would easily be in first place (so far) on some or all parts of the list. Several of my siblings would probably be ahead of me due to more frequent traveling.